Have you ever wished that your smile were straighter or brighter? Are you embarrassed by your teeth? Does your smile have a noticeable cosmetic flaw, such as a gap, a chipped tooth, or misshapen teeth? We are lucky to live in world where the solutions to these problems are convenient and affordable. Cosmetic dentistry refers to dental work that improves the appearance of a person’s teeth, gums, or bite. Focusing on aesthetics like color, position, shape, size, and alignment, these procedures improve the appearance of a person’s smile. Some correct a minor problem while others give the smile a complete makeover. Although many of these procedures don’t address functional issues, they can still have a significant and valuable impact on a person’s life. Learn more about the many benefits of cosmetic dentistry below. First of all, our reputation is an essential part of who we are and what we do. At the Burgess Center for Cosmetic Dentistry, we take pride in serving our customers to the best of our ability. Our business would not be where it is without our customers. We know that the many loyal patrons, in the local community help us be a great company. They return year after year which means we must be doing something right. The five star reviews our valued customers leave really give you a feeling of the connections we strive for in the surrounding community. 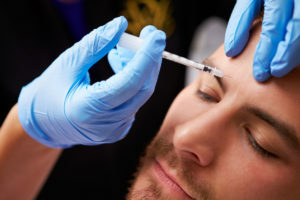 Botox is in huge demand. Botulinum toxin has proven to be a successful and valuable therapeutic protein. Losing teeth can have a significant impact on the appearance of your smile while creating functionality issues. It also can put a serious dent in your self-confidence. Two of the most common solutions that dental professionals use to address these problems are dental implants and dental bridges. While both approaches fundamentally address the same challenges, they present, at a technical level, very different options for you to consider. If you are looking for the right solution for missing teeth, it’s important to understand the treatment options that are available to you. It’s also crucial to gain an understanding of what each entails before deciding if it’s right for your specific needs. Here’s what you need to know about implants and bridges and finding what’s best for you. The underlying structure of a tooth is more complicated than most people appreciate. When this structure — which includes bone, ligaments, and nerves — is removed, the neighboring area slowly begins to deteriorate. A dental implant replaces this structure with a metal post, typically one made of titanium. Over the period of a couple of months, new bone should grow around the implanted metal. 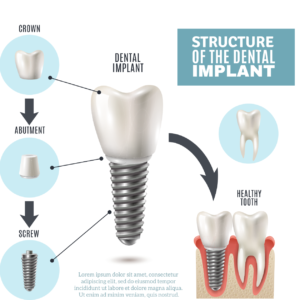 Once the new structure is tested by your dentist and declared secure enough, a crown will then be screwed on top of the implant and sealed into place. One of the biggest advantages of dental implants is they place less of a burden on the surrounding teeth and promote healing of bone structures and gums under the teeth. They also tend to reduce long-term risks posed to the jaw. Generally, a high-quality dental implant should be expected to last a lifetime. A disadvantage of dental implants is they can be a costly treatment. Especially in cases where a large number of individual teeth need to be replaced in different spots. Even the replacement of a single tooth with an implant can cost several thousand dollars. When trying to replace a particularly large number of teeth, it’s not unusual for dentists to recommend a traditional dental bridge instead of an implant. Implants also tend to take longer and require multiple procedures to complete. Oral surgery is often required, and your mouth may take months to heal following the initial implant procedure. In all but the most extreme cases, bridge work will typically take no more than a few weeks. A dental bridge attaches to the remaining healthy teeth surrounding a gap to create a bridge across the area in a recipient’s smile. In more traditional versions of the procedure, the two teeth on opposite sides of a gap are shaved down to accommodate a bridge. A cap is then placed over each tooth and is accompanied by the bridge, replacing the missing teeth. In parts of the mouth that can handle less force or where only one tooth is missing, dentists now often use a winged, or Maryland bridge that’s embedded into the neighboring teeth, rather than one that fully caps them. In some instances, there may not be teeth on both sides of a gap. One approach to this problem is to install what’s called a cantilevered bridge. This type of bridge is attached to a single tooth on one side, and the bridge structure hangs over the gap. The main advantage of bridges is that they are considered to be one of the most cost-effective methods for replacing missing teeth. Another advantage of bridges is they don’t require bone grafting if bone loss is present. Bridges also offer a quicker process for replacing missing teeth. One of the biggest disadvantages of bridges is that they place greater strain on surrounding structures, especially the two teeth which are attached to the device. For this reason, a bridge rarely is expected to last a lifetime. Bridges also do not address concerns about underlying structural problems. This means that long-term issues arising from bone loss due to the removal of teeth will continue to advance even after the gap is addressed. Cantilevered bridges are especially notorious for creating problems. They place a significant amount of stress on the single tooth to which they’re attached. Maryland bridges also often come with problems, due to their minimal amount of attachment and limited capacity to absorb force. Also, if a Maryland bridge is not properly maintained, it may lead to the loss of additional teeth. In cases where patients have lost a significant number of teeth in a row, it’s not unusual for dentists to recommend a mixed approach. For example, the loss of all the molars may mean your dentist needs to put in an implant at one end, where there is no longer a tooth. Your dentist may then attach a cap at the other end, creating a bridge from the implant post to the healthy tooth. Likewise, people who have lost most or all of their teeth in a particular section of their mouths may be good candidates for bridge-like structures that straddle two implant posts. It’s important to note that many insurance companies see both dental implants and dental bridges as high-end, costly treatments. However, due to the vast difference in cost between the treatments, most insurance carriers are more likely to pay for a bridge procedure than an implant. If you are considering treatment for a missing tooth, consider speaking with your insurance provider before deciding on the right option. For most people, cost is one of the most important considerations to make when deciding on what option would be right for you. Talking to your insurance provider can provide helpful information that could assist you in deciding what treatment to move forward with. The most important thing you can do to ensure you find the right treatment for your missing tooth is to talk to your dentist about what options may be right for you. Your trusted dentist can carefully weight all of the specific considerations of your situation to make the right recommendation for you. Your dentist will want to provide you with the right solution that will be as gentle as possible while providing years of continued use. Burgess Center for Cosmetic Dentistry has a dentist office in Jacksonville, FL with a dentist that can help you address any missing teeth and develop a treatment plant that’s tailored to your needs. Schedule an appointment with an experienced dentist today. Unusual noises. Strange smells. People whose faces are hidden behind surgical masks. 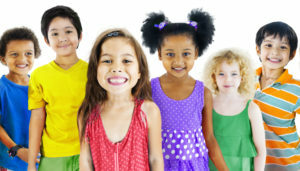 For a child, a trip to the dentist can cause some anxiety, but it doesn’t have to be that way. It’s important to make your child’s trip to the dentist as comfortable as possible to set the groundwork for a lifetime of healthy habits. Invisalign is a new technology in the field of dentistry. It is designed to give orthodontic patients the smile they have always wanted without the hassle and the worry attributed to metal braces.